Courage, perseverance, patience, resilience, determination, knowledge, stability, strength, reward. Fueled by faith, mysterious Panther is an empress of reclaiming her power. With heightened awareness, she is prepared for any opposition. Her resilient spirit shines when faced with the dark side of the moon. Amid the shadows of apprehension, Panther will help guide you safely as you face your fears and defend your position. By taking the right steps, your hard work on a venture is coming to fruition. You have invested a great deal of time and energy, and you’re on guard. Fear not, for your perseverance is about to pay off, and your efforts will prove to be victorious. You’re on the right path. Remain determined, and trust that you have the knowledge to see it through. 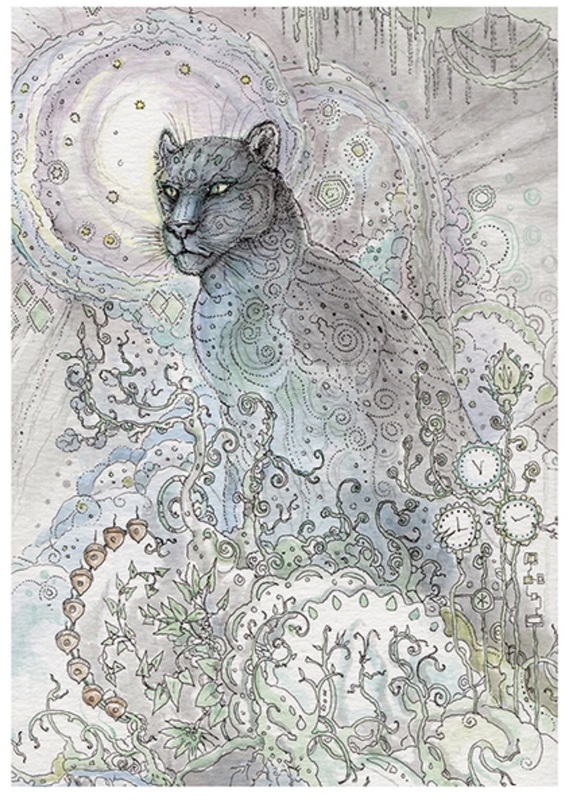 This entry was posted in Artist, Deck Review, Featured Card of the Day, General Tarot, Readings and tagged 9 of Acorns, Panther, Paulina Cassidy, Spiritsong, Tarot.